The Chinese cellular company is going to revise its monthly package of 4 GB for its 4G customers from Rs.50 to Rs.600 and it will provide 2 GB data. 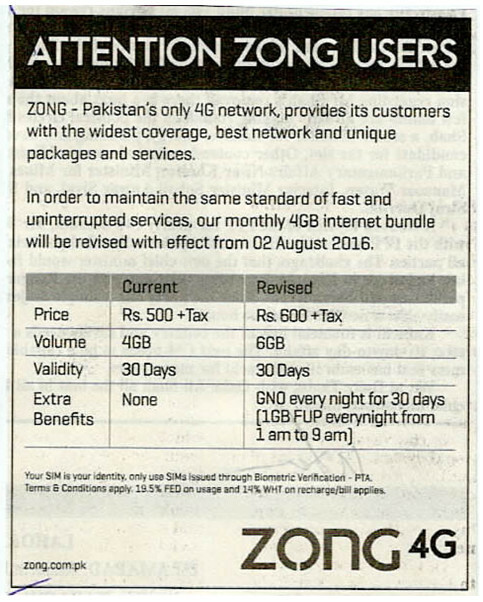 Zong will also offer Good Night Offer freely to its customers and they will consume 1 GB internet from 1 am to 09 am every night. The new charges of 4GB will be applicable from 02 August 2016 and these charges will be excluded from the 19.5 percent GST taxes. It is clearly evident that there is increase of Rs.100 in the monthly fee and Zong will offer 2GB additional GBs per month and 1GB more data at night, which will be very attractive for some users as they can use this package at minimum cost while various other customers will not like this increase in the package as their data usage limit is not increased and they do not need excessive data usage. The operators always look at the more subscription and utility and they look price hike packages. So they try to make such plan under which they provide more lucrative policy to get more revenue, as it is allowed to the operatives in the competitive atmosphere under the provision of rules of the regulators. The operators can take advantage of the quality and availability of their services or packages, which can be different and unique from other operators and it can become center of attraction for most of the users.